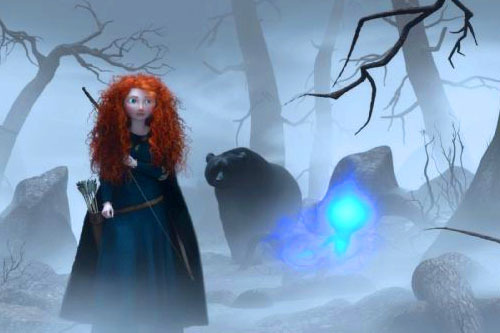 Brave is a nice, pleasant little film. It is certainly enjoyable. It just seems like it could have been... more. And here's where Brave kinda developed problems. Once I realized what the consequences of Merida's actions were, I actually remember thinking, "Oh, you mean this is the story they want to tell?" That's never a good sign. And so Brave becomes a strangely small, contained, and personal film. It takes place all within a couple of square miles, and with a cast of only a few people (plus a lot of extras). There's some magic and supernatural things and talk of destiny, but again it's very small-scale stuff. It's essentially a relationship drama between two characters. And not that there's anything wrong with that, but when you've got a movie that takes place in medieval Scotland and there's a heroine who's an archer and some bad magic involved, I expected something a little bit more... epic. Something where the fate of more than just one person (and by extension her family) is involved. I try not to base my movie reviews on my expectations, but the first act of Brave really seemed to set it up to be something more than it ends up being. But small-scale Brave is good. It's a fun, heart-felt little movie. And it is just absolutely gorgeous. There's good comedy, good pacing, good acting. It's got a good message. It's a well-told little fairy tale. But that's it. I did enjoy it, and I do cautiously recommend it, just don't go in expecting anything more than what it is.